just up the pike: give yourself a hand, blogosphere . . .
give yourself a hand, blogosphere . . . Residents carried signs and marched down Ellsworth on the 4th of July in protest of the Peterson Companies' limiting the right to free speech in their Downtown Silver Spring complex. - In May, the Gateway Heliport Gallery hosted a Blogger Summit with a panel of speakers including myself, Henry from the Silver Spring Scene and Eric from Thayer Avenue and moderated by local activist Richard Jaeggi of Silver Spring Town Center. 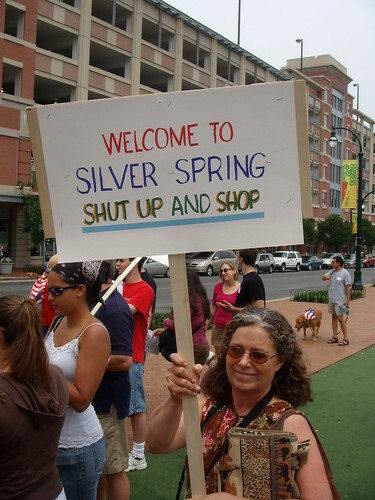 - Later that month, South Silver Spring held its first Block Party, heavily publicized on the Silver Spring Scene and a blog created by the South Silver Spring Neighborhood Association. - In June, Just Up The Pike was featured in a Washington Post story about local bloggers. County Executive Ike Leggett at a press conference announcing plans to open a Fillmore music hall in the former J.C. Penney Building on Colesville Road. - The following week, Congressman Al Wynn (D-Dist. 4) invited myself and Jen from the Penguin to his re-election campaign kickoff, consisting of a Metrorail-and-bus ride across Montgomery County to show his support of public transit. - In July, a group of local bloggers and photographers started the Free Our Streets blog to protest the Peterson Companies' limits on free speech on Ellsworth Drive, which it had leased from the County. Their efforts culminated in a march through Downtown Silver Spring held on the 4th of July which led to the County's affirmation of First Amendment rights in public spaces. - In September, County Executive Ike Leggett held a blogger briefing discussing the selection of a new host for the proposed music hall in the former J.C. Penney building. Two days later, the County announced that it had signed a letter of intent with international promoter Live Nation to run the venue. - In November, the Post's Marc Fisher named Karl of Silver Spring, Singular "Blogger of the Month," citing his blog's "entertaining and informative look into life" in Silver Spring. I'm completely blown away by how the Silver Spring blogosphere has exploded over the past year - and that wouldn't have been possible without the people who read Silver Spring blogs, write comments, and send tips. Together, we've become one of the D.C. region's "bloggiest" neighborhoods, so to say, and I'm looking forward to another year of laughs and love on the blog. Would you mind pulling my picture off? I never gave anyone permission to take it much less use it.